Snack Girl features potatoes because they are inexpensive, nutritious, and super yummy. One of my favorite potato dishes is served at San Francisco Giants’ games. There are these “garlic fries” that stink up AT&T park. Man, those are good! They go great with the common beverage found at the park, hot chocolate (not really). The fog makes it fairly cold to be watching a game, and one time I actually wore a snow parka. Supposedly, Mark Twain said this, but it turns out that there is no evidence he did. San Francisco residents say this often. Since I no longer live in San Francisco, I have to make my own garlic fries and I saw this “Hasselback Potato” recipe and decided to give it a try. This looks really fancy, but it is easy to pull off. Line up chopsticks (or the handle end of wooden spoons) under two sides of the potato and cut down until you hit them. It is fast and no peeling! I like to simply pour garlic all over my potatoes. I’m crazy like that. If you don’t like garlic, skip it. These are a great way to know EXACTLY how much potato you are consuming and savor your potato experience with lots of slices. Do you like garlic and potatoes? Line up 2 chopsticks lengthwise close to a potato. Slice across the width in sections as thinly as you can. Melt butter and mix in garlic. Using a pastry brush or spoon, drizzle the butter garlic mixture into the slices of potatoes. You can open it up like an accordion with your hands. Sprinkle on salt and pepper. Bake for one hour until golden brown. Serve immediately. This sounds so good. I'm making it for dinner tomorrow. What are the serving portions on these potatoes? 1/2, whole, or two potatoes? 144 calories per serving seems small for one potato. The video was scrambled, so I couldn't get that information. These sound so yummy! I'll be trying this recipe soon. I entered the ingredients into the recipe builder on WW and found that to get 4 points per serving, this recipe serves 4. I specified "large" potatoes, but smaller ones would be less (2 medium potatoes make it 3 points, still 4 servings). Hope that helps. Oh, and this recipe looks awesome and I'm going to definitely try it. The hardest part seems to be waiting the hour for it to cook. Thank you for such good ideas. Could one use a sweet potato and feel less guilty when one gobbles more? I definitely have to ditto the 'yummy' comment! I'll be buying some potatoes on my next trip to town! I've done these for years but add chopped onions and wrap them in foil to cook on the grill. DELICIOUS! Just bought some naturally infused flavored olive oil so would not even have to make it!! How easy is that! You can never go wrong with potatoes in my mind! I LOVE GARLIC and these potatoes sound great...plus I think the kids might think they are neat looking! That's too much fat for me. (I prefer to eat plant strong which is without oil) I think I'm going to try this with minced garlic (A LOT of minced garlic) wedged between the slices while it bakes. And bake them wrapped in foil with some sweet onions, that will prevent them from drying out and totally cut the fat to zero! I just made these last night for dinner and my family LOVED them - even the non-potato eater! After they baked for about half an hour, I "basted" them with the butter that had run off them into the pan, and by that time, they had opened up a little more. When they were done, they were crispy on the outside, soft and baked potato consistency on the inside. Delish. To save on calories and fat, we just ate 1/2 of one each, and that was plenty. These were easy and I'll be making them again! Jessica, 3 g fat is "too much fat?" 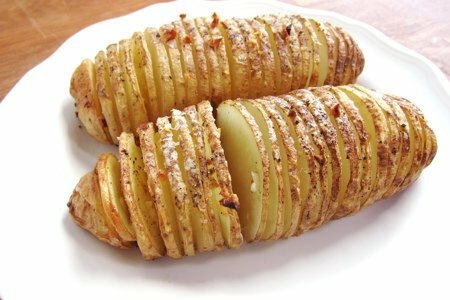 I love Hasselback style potatoes! I'm with you on the garlic, but the rest of my family likes theirs just plain with olive oil and seasoned salt (a lot of seasoned salt). We love baked potatoes in our house - this recipe will definitely be a hit! Jessica, did you try it without oil? How was it? I prefer to skip added fats as well.